By Costa Maragos Posted: May 3, 2017 6:00 a.m.
Moving around thousands of kilograms of rolled up carpet daily is no easy task, even with the help of machinery. Derek Grain is well aware of that after having worked a number of summers in the warehouse of Parkland Carpet One in Regina. 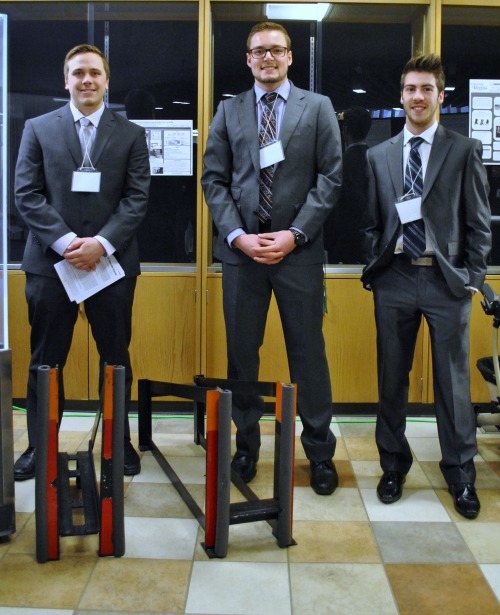 Now, Grain and his fellow Faculty of Engineering and Applied Science students, Zachary Hass and Michael Taylor, have invented a safer way to move all that carpet. Not only that, the team has received national recognition on the merits of its safety. The student team has received the second prize at the 2017 James Ham Safe Design Award Competition awarded by Minerva Safety Management Education. University and college teams from across Canada compete for this prize. This is the second year in a row a U of R team from the Engineering Faculty has received one of the top two Minerva prizes. This annual competition challenges Canadian university engineering students to make an original contribution toward integrating safety into engineering design. The students worked under the supervision of Dr. Denise Stilling, associate professor of Industrial Systems Engineering. The students' design is called the “Rapid Attachment Interchange System for Forklifts.” The system can reduce workplace injuries when changing forklift attachments in the warehouse. The students worked in close consultation with Parkland Carpet One. “In doing so the ergonomics of the process are greatly improved. Safety has been improved by removing the unused attachments off of the warehouse floor and into a safe area under the carpet racks. Safe operating procedures have been created for the new system,” says Grain. The system is now in use at Parkland Carpet One. For the students, the award caps off a successful final year of studies in the Faculty of Engineering and Applied Science. The U of R team will formally receive the James Ham Safe Design at a national safety conference in Mississauga, Ontario, May 3. The award honours James Ham, an engineer, whose Royal Commission Report on Health and Safety led to the creation of Ontario’s Occupational Health and Safety Act in 1979. Minerva Canada is a non-profit volunteer-run organization that encourages future engineers and business leaders to create healthier and safer workplaces.